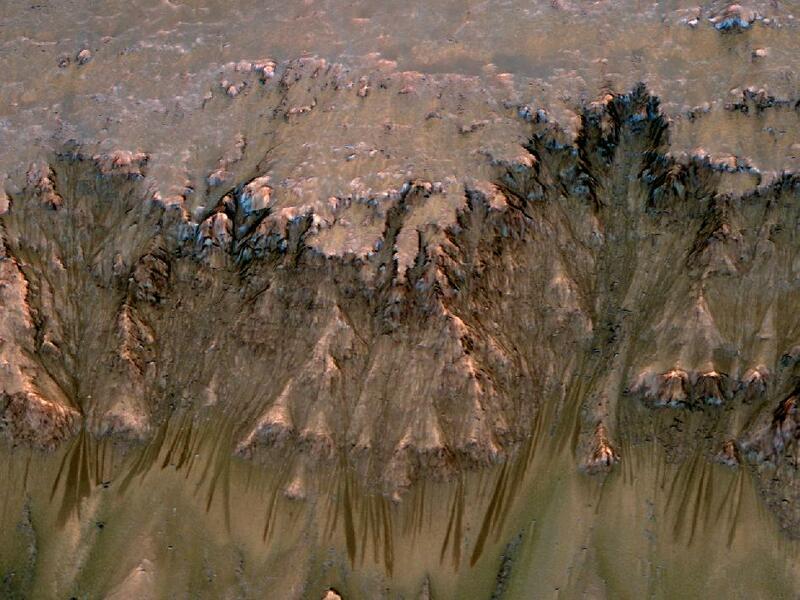 NASA has unveiled its strongest evidence for the existence of flowing salt water on the surface of Mars. It has been over ten years since water was first confirmed on the red planet but it was believed to be found only under the surface and at the poles - frozen all year round. But new images taken from the Mars Reconnaissance Orbiter describe show dark, finger-like groves in the planet's surface believed to be flowing water from mountain slopes. The features appear in late spring and fade in the winter. As mentioned already, the water is thought to be salty, as the Martian surface is very salty, with the saltiness lowering the freezing temperature of the water, allowing it to exist in environments where pure water might boil or freeze. The Martian surface is so salty though that any water on its surface would probably to too briny to sustain life, as we know it anyway. But there are many forms of extremophile bacteria that are able to withstand the toughest of conditions on Earth and similar organisms could have evolved to survive the harsh salty conditions - possibly even able to "hibernate" during the winter months. Discovery News has more information on this exciting astro-biological development. Click here for the original paper, published in the latest edition of the journal Science.